2BR/2BA, Private waterfall, Horseshoe pits, Theater room, and Kid's zipline! Welcome to "A Touch of Luxury Cabin" located on the border of Mill Spring and Lake Lure. The cabin is centrally located to both places, and less than two miles from the lake on Lake Lure. Celebrate your special occasion in this private, custom-built, 1672 sq. ft., 2 Bedroom/2 Bath log cabin. If you appreciate woodworking, you will love this cabin! 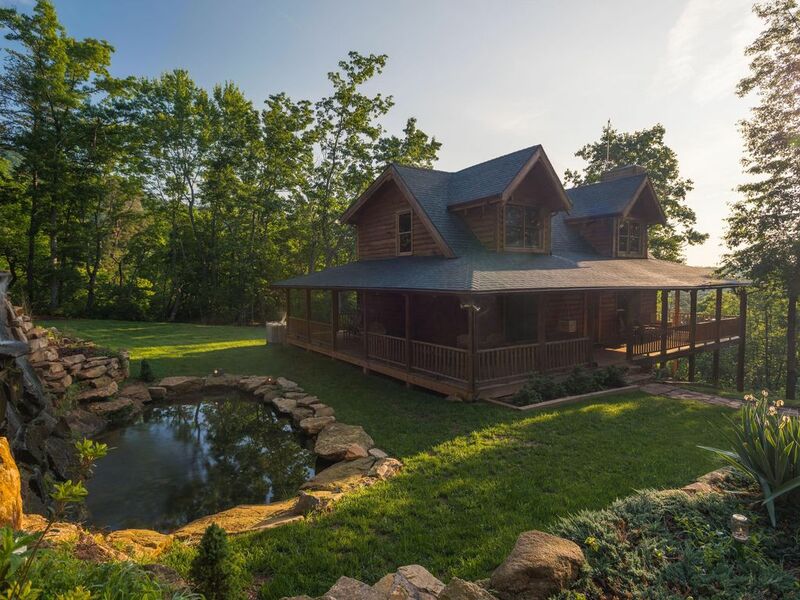 A Touch of Luxury Cabin is located 15.9 miles from the Tryon International Equestrian Center, and only 1.5 miles from the Lake Lure Ingles grocery, gas station, pharmacy, and Red Box. Ingles is the only major grocery store in the area, which makes the cabin location very convenient. Chimney Rock State Park is a 6.5 mile drive. The Beach in downtown Lake Lure is 5.5 miles away. The cabin is the perfect location for taking day trips to explore the surrounding areas of Tryon, Chimney Rock, Lake Lure, Mill Spring, Columbus, Saluda, Flat Rock, Hendersonville, Black Mountain, Asheville, and Blowing Rock. This charming log cabin home is in a secluded wooded setting, while still a short drive to the touristy attractions. The cabin comes with Directv channels on all TVs, and also free Wifi is available throughout the cabin. Please take note: Our home is located in the mountains and we have purchased the fastest internet available in our area. This may not be considered fast if you are from the city; keep in mind we are in the mountains and cell service and internet throughout the area, can be spotty at times. Note: In between the first freeze and last freeze of the year, guests will be provided complimentary firewood for one evening fire per night, as the waterfall will be closed. However, the natural waterfall down a private walking trail is available. Main floor bedroom has King bed pillow top mattress, ceiling fan, 32 inch flat panel TV. Double closets have plenty of storage space. Standard full bath w/ tub/shower combo is directly across from this room. Upstairs bedroom has Queen bed pillow top mattress, ceiling fan, 32' flat panel TV, and private bath. This bathroom has a Jacuzzi tub and separate shower. Living room has a 55 inch flat screen TV. Kitchen is fully stocked with cookware, dishware, utensils, microwave, toaster oven, coffee maker, and many other basics. The theater room has a 110 inch movie screen with ample seating and popcorn machine. Complimentary popcorn and movie candy are provided! The washer/dryer are adjacent to the theater room. The 8 ft, covered, wrap around deck offers a gas grill (propane included), an outdoor bluetooth sound system, plenty of seating, a swinging bench to enjoy the waterfall, and spacious dining area. Play a game of horseshoes in the back yard, while the young kids swing on the backyard zipline. NOTE: after the 1st freezing the waterfall is shut down, and guests are provided complimentary Firewood for one evening fire per night of their stay. The waterfall opens after the last freezing. Enjoy your next vacation at A Touch of Luxury Cabin! All basic bedroom linens and pillows provided. The fireplace is available for use during cold months when the waterfall does not run. Complimentary wood is provided for one evening fire per night of stay. Guest must purchase additional wood. 1 full roll of paper towels. Jumbo size bottles of shampoo, conditioner, and body wash are provided. Plenty of toilet paper. Will send complete list of items once booking is made. Standard Mr. Coffee maker. Filters, sugar, and powdered creamer are provided. Basic kitchen supplies such as paper towels, dish lotion soap, dishwashing detergent, spice rack, aluminum foil, saran wrap, etc. A Blu Ray player is provided. There is a croquet set available. There are horseshoe pits that are not pictured yet. Tennis courts less than six miles away. Tennis equipment is not provided. Beautiful home! My family and I loved every moment of our last minute vacation! With young children the house is the perfect location being close to the grocery store and main attractions in town. The house was beautifully equipped with everything needed for a memorable stay away from home! My husband and I enjoyed a break from Florida and had a great few days in the quiet mountains near Lake Lure. The cabin was just right - so many details taken care of - and we enjoyed building a fire every night. Hosts Carl and Bridget were very helpful. We would definitely return again, highly recommend. My best friend and I needed a get away just to relax. This was the perfect cabin in a beautiful secluded area. It was beyond peaceful. The house is amazing, it is definitely a touch of luxury. There is a theater room that is extremely comfortable. There is also waterfall that you can sit on the swing and just relax. The house was extremely clean which is a plus. All you need to bring is yourself and you are in for a great vacation. The house comes with everything and more!!! The owners Bridget and Carl were very responsive and nice. My mom, sis, & I loved our weekend getaway in this beautiful cabin! It was perfect! We had a relaxing time just enjoying each others company. The privacy & seclusion was a plus. The waterfall was beautiful & soothing while swinging & admiring. The movie theater downstairs was very much enjoyed watching movies in the evening. The cabin was clean & beautiful! The wifi & fireplace was much appreciated. I Will definitely be referring to family & friends. Would love to visit again soon. Paradise is lost no more! This house is AMAZING! Everything is custom made. Its a work of love and pride and art from the owners! Speaking of the owners - they are super quick to respond. And trust me, we are Question King & Queen. And they answered us quickly and every time. The weather was dreary so we took full advantage of the 110-inch theater screen and full stocked movie room. (One quick note - bring Blurays to watch but not 4K Bluray; they are not compatible). We won't go into details but the owners added a personal touch and did us a favor to enhance our Valentines/Birthday getaway. We were so appreciative! We may have to try out luck on this place in summer or when fall foliage is at its peak - I'm sure it will be spectacular. The cabin is exactly 15.9 miles from the Tryon International Equestrian Center. The drive time is 20 minutes. The Lake Lure Ingles grocery store is conveniently located 1.5 miles from the cabin. This is the only large grocery store in the area. CANCELLATIONS: Please use a credit card that has traveler cancellation protection in case of emergencies, bad weather, sickness, etc. Once your reservation has been confirmed, those dates are blocked from other guests who would like to book. Therefore, we cannot provide any full or partial refunds unless we can re-book the dates. You can also purchase separate trip cancellation insurance. There are no links allowed on this site, so just search internet for "insuremytrip" or "travelguard" websites. If you must cancel, then we will refund If we can REBOOK THE DATES TO ANOTHER GUEST.